I sometimes hear Radio Jackie in the mornings at work. For some reason, my colleagues in the Royal Mail Delivery Office where we prepare tonnes of mail for delivery to the ever grateful great Britsh public don’t like the BBC. The radio is on but we have to put up with Magic, Heart, Kiss, Capital and occasionally Radio Jackie. Once in a blue moon, we might get Absolute or Xfm, but that’s a very special occasion, someone’s birthday or maybe they’re celebrating 40 years in the job. Radio Jackie is based in Tolworth, just up the road, so at least the traffic reports are potentially useful. I have sometimes called my wife at home to tell her she should drive to work a different way today, as Leatherhead Road is blocked. The music played at breakfast time is OK, nothing too challenging but equally, nothing to get excited about either. The music mix is better and wider than Magic claims for itself. The boy (not as funny as he thinks he is) and girl (can’t possibly be as stupid as she acts) combination of presenters is fairly typical of these breakfast shows. A day in the life of Radio Jackie, with Peter Robinson. It was fifty years ago today, Sgt Pepper taught the band to play… Oh hang on, that’s not right. No, it was fifty years ago today that The Beatles recorded their first album, ‘Please Please Me’ at the Abbey Road studios. The whole album, recorded in one day. To commemorate this historic day, BBC Radio 2 are re-recording the album during the day, with artistes such as Gabriella Aplin, Stereophonics, Joss Stone, Difford and Tilbrook and others. I arrived home from work in time to hear Stereophonics singing I Saw Her Staning There, during the Jeremy Vine Show. Steve Wright’s on as I type and at about 3.30, we’ll hear Joss Stone sing A Taste of Honey. There’ll be more during Simon Mayo’s Drivetime show and especially during Jo Whiley’s programme later on. Here’s the official page which is being updated continually during the day, with photos as well. Read The Independent article. And the BBC’s own news. 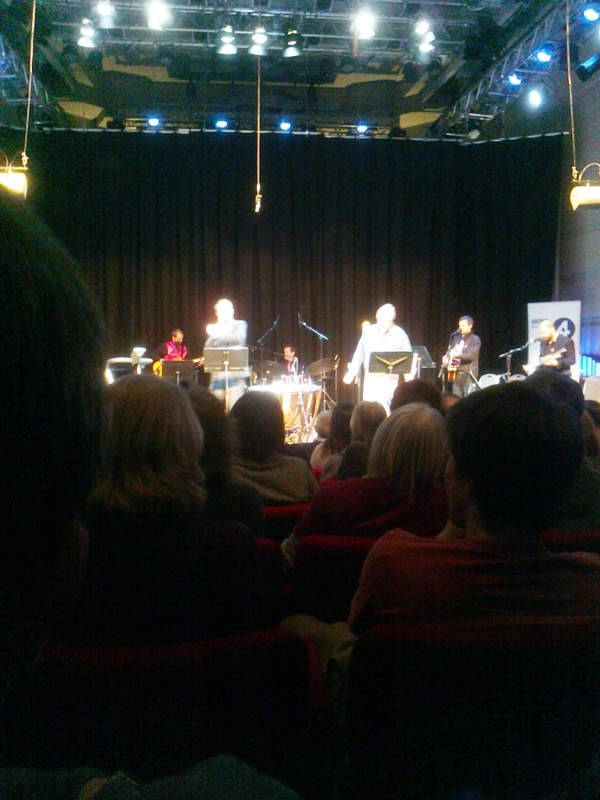 We were lucky enough to get tickets for a recording of The Horne Section a few nights ago. The first series was broadcast on Radio 4 last year, this is the second series. And it was a fun show: the hour and a quarter of entertainment will be edited down to a mere half an hour. In any case, I was just excited and pleased because these were the first tickets we’ve acquired for any BBC show for a very long time! And, the first visit to the Radio Theatre, in Broadcasting Hose, for many years, too. Not the best photo in the world, but obviously cameras and recording equipment are banned. But you can see the participants, sort of: Alex Horne, some of the very talented band, and the show’s guest, Phill Jupitus. It is primarily a comedy show but making good use of the very talented band, three members of which are apparently school friends of Alex Horne’s. Radio 4 – the Horne Section. This also links to their official site and Twitter accounts. The new series starts on February 24th.